"It is no accident that both the 1927 and 1938 buildings of Ainslie School are recognised nationally as highly significant architectural designs…planning for excellence in contemporary design was a feature of both the 1927 and 1938 Ainslie School buildings, in keeping with the other Federal Capital Territory designed and build structures of the decades of the 1920s and 1930s." Both sites are striking buildings. 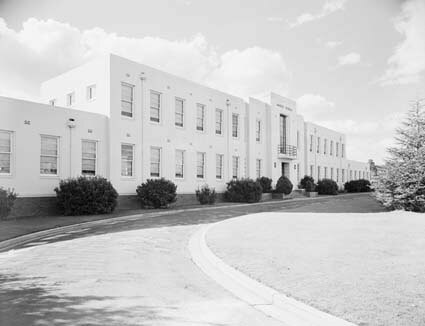 The original 1927 building, located in Elouera Street, ceased being part of the school in 1979 and has been occupied by Questacon and the School Without Walls. The current tenant is the Ainslie Arts Centre. The building today's school occupies was built in 1938 and is a fine example of the era's Art Deco style, especially in the symmetrical facade, chevron ventilators, front foyer and library mural. It was designed by Cuthbert Whitley under the direction of Chief Architect E H Henderson of the Dept of the Interior Works and Services Branch. After its construction, the original building became the infants department of the school while the new building housed the primary classes. The school has undergone large shifts in population, over 1,000 students during the 1950s, and is now school for 419 students, including those in the off-site preschools of Reid and Ainslie Baker Gardens. Over the years there have been fourteen Principals, the first being Mr Horace Martin. The Commonwealth outsourced the provision of the education program to the NSW Department of Education, and it was considered a particularly attractive posting for NSW Principals and teachers. Management of the school was handed over to the interim ACT Schools Authority in 1974. During the years when both school sites were in operation, there was a "tuckshop" operating from each site. It was staffed by volunteer parents under the direction of a manager. The "Oslo" lunch was a feature of the food offered during the late 1940s and early 1950s, in an attempt to provide students with healthy options. There was division among parents as to whether to offer sweets as well as healthy food to improve profitability. Today the Kidzbar is a Nutrition Australia award winning healthy canteen, which makes a modest profit and sells only healthy food. The Reid Preschool was built in 1944 and opened in 1945 originally as a mothercraft centre. It provided a focal point for women living in the area and was developed through community interest and effort. The Preschool is adjacent to the the tennis courts and pavilion in Dirrawan Gardens in Reid. Ainslie Preschool in Baker Gardens was opened in 1950. Both preschool sites have a variety of purpose built buildings and leafy quiet outdoor play enviornments with a focus on sustainability. Principal Richard H (Harry) Butler was Principal in 1964 when the school established a relationship with Nezu Elementary School in Tokyo, Japan. It was the first school in Australia to have secured such a relationship and this is considered remarkable as Australia had only re-established a post war relationship with Japan in the late 1950s. A more detailed account of the school's relationship with Japan, including the current sister-school relationship with Tsubai Elementary School, Nara, is Sister Schools page. Music has always been an important part of the school program, with two choirs being formed early in the school's history. There has always been singing, bands and instrument tuition. In 1983, Ainslie School accepted an offer from the Canberra School of Music (CSM) to pilot a Primary Music Education Program. In the 1990s, the Principal, Ms Prue Clarke, reaffirmed the highly successful relationship with the CSM and decided it would provide music for everybody at the school. There continues to be a strong tradition of music education and it is exemplified by the strong singing in assemblies and student performances and the number of students playing instruments. In 2012, the Instrumental Music Program was introduced into the school and the resulting school band features brass and percussion instruments. The strong support of the parent community also dates back to the school's beginnings. The heritage Peter Pan mural in the Library is dedicated to the women of the school community in recognition of their "interest and energy". From the beginning the P&C Association has kept handing the baton to generations of other parents to continue the work and they have continued to live the school's value of "community". The school fete has become a must do for many people in the Canberra community and is always a huge success. The depth of feeling about Ainslie School in the local and greater Canberra community was obvious in 2012, when the Directorate proposed fencing the school. An extensive consultation process generated a large volume of correspondence and newspaper and radio reports, which led the School Board to conclude the majority of respondents were opposed to the move. The school remains unfenced. Ainslie School occupies a special place in the hearts of many Canberrans. It will continue to uphold the traditions that many hold dear.